Rainbow Filters have manufactured cleanroom products for Pharmaceutical and Cleanroom applications. We are able to engineer cleanroom systems to any specification. We have the industry experience and resources to handle projects from small cleanrooms to large Class 1 applications. 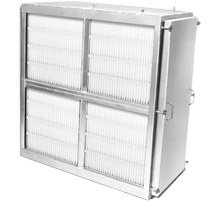 Our cleanroom filtration products are utilized by leading manufacturers in the microelectronics, pharmaceutical, and biotechnology industries around the world. Our cleanroom team is comprised of professionals focused solely on cleanroom applications. The team is active throughout the life-cylce of every project: specification review; engineering design; manufacturing and process control; testing and quality assurance; and field support.